How is Thanksgiving next week? I looked at the calendar yesterday and was shocked. I thought I had another week to get ready. I need to get my act together. It’s game time! We aren’t doing anything big for Thanksgiving since we don’t have family close by, but we are going to celebrate with good food. We are making a small feast to share with friends. I don’t have the entire menu set yet, I know, I need to get on that. Hey, I thought I had another week. I do know I am making Chopped Brussels Sprouts with Dried Cranberries, Pecans & Blue Cheese. This side dish is so easy and is a great addition to any Thanksgiving table. 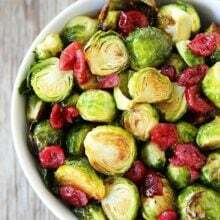 If you usually turn up your nose when you hear the word BRUSSELS SPROUTS, hang with me on this one. The Brussels sprouts are not cooked, so they don’t have a strong flavor, but FYI cooked Brussels sprouts are good too, you have to try my favorite roasted Brussels sprouts. 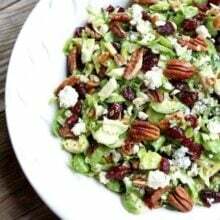 But anyways, for this recipe, fresh Brussels sprouts are chopped and mixed in with dried cranberries, toasted pecans, and blue cheese. All of those goodies get drizzled with a simple apple cider dijon mustard dressing. Looking for an easy side dish to add to your Thanksgiving table? 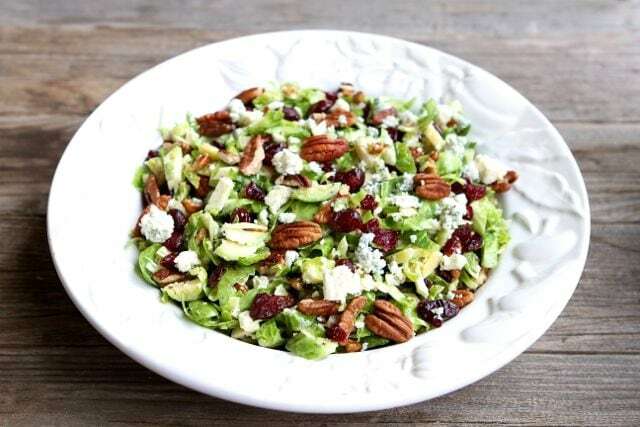 Make Chopped Brussels Sprouts with Dried Cranberries, Pecans & Blue Cheese. 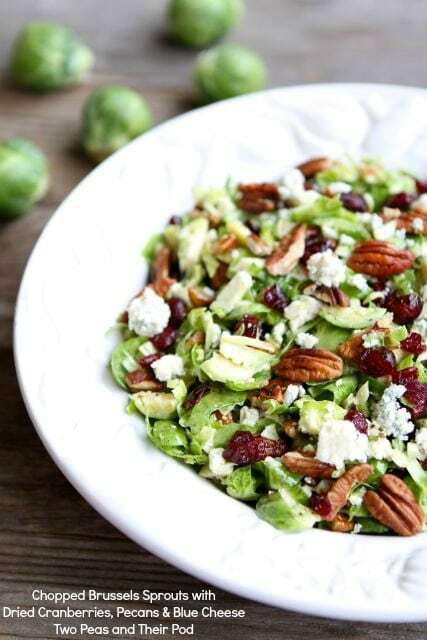 Chopped brussels sprouts with dried cranberries, toasted pecans, blue cheese and a simple apple cider dijon dressing. 1. Rinse brussels sprouts and remove any damaged or dirty outer leaves. Place on a cutting board and slice off the hard root end. Using a sharp knife, thinly slice the brussels sprouts. When you're done, use your fingers to gently separate the leaves so that the shredded sprouts resemble a very fine slaw. Place in a large bowl and set aside. 2. To toast the pecans, place a medium frying pan on the stove top. Turn on medium-high heat. When the pan is hot, add a single layer of pecans. Stir frequently with a spatula until they start looking darker and you can smell the toasted nuts. Remove from heat and spread out on a plate to cool to room temperature. Make sure you watch the pecans closely, they can burn pretty quickly and they will keep cooking after removing them from the pan. 3. While the pecans are cooling, make the dressing. In a small jar, add the olive oil, apple cider vinegar, Dijon mustard, salt, and pepper. Put a lid on the jar and shake until mixed well. 4. 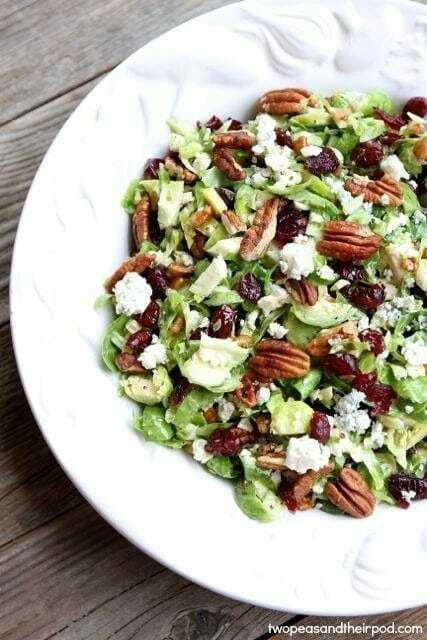 Add the toasted pecans, dried cranberries, and blue cheese to the chopped brussels sprouts. Pour the dressing over the salad and toss until all of the ingredients are well coated. Serve immediately. Note-you can also use a mandoline or food processor to chop the brussels sprouts. Sounds like a great combination of flavors and perfect for the holidays! yum ! Love it! I just made Brussels Sprouts last night and I still have lots of those green little bundles left to use! I’m going to try your version over the weekend!! 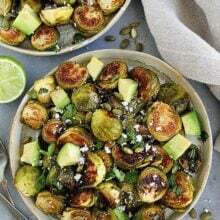 This combination of flavors is one of my very favorites, and reminds me that I haven’t had enough Brussels sprouts yet this fall! Thanks for the reminder and the link love, Maria. I LOVE Brussels Sprouts!! Except for some reason, I always call them Brussel Sprouts, which is totally wrong but it’s like I can’t stop. Anyways — these look completely amazing!!! i have literally been eating this same flavor combo for lunch for the past 2 weeks – amazing! except now i’m going to have to try it with brussels sprouts! oh my gosh- brussels are my most favorite vegetable! I can eat them any way! This salad looks amazing. I am totally with you- I thought there was another week before thanksgiving- yikes! I have recently gotten into shredded Brussels sprouts- definitely a fan! Plus I make a vinaigrette like this all the time. So yummy, and it sounds like they’d go great together! Wow that looks amazing! Could I use asparagus instead? This is such a pretty salad, and it’d be perfect for Christmas too, with its red and green! 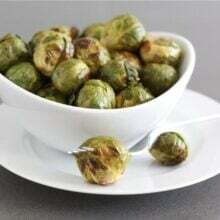 I’m a fiend for roasted or sauteed Brussels, but I’ve yet to try raw Brussels sprouts. I’m assuming they taste similar to raw cabbage? a shot. I love blue cheese and love cranberries…..
I’m not super wild about bleu cheese. Do you think goat cheese would work in this or is there a better alternative? Sprouts are one of my weird addictions – love them!!! Your version looks amazing! I love that we both made brussels sprout salads today! Yours has so many fun mix-ins! I actually have just taken a liking to brussels sprouts so I’ll have to try this out!! A beautiful Thanksgiving side dish! Love everything about this recipe. I just may have to make it to go along with our T-day meal! I have never tried brussels sprouts but I’ve been wondering about them lately. I don’t like dijon mustard or mustardy dressings. What other type of dressing flavor would work well with these flavors? Balsamic vinaigrette or something like a raspberry or other fruity vinaigrette? What do you think? Balsamic or a raspberry vinaigrette would work! Enjoy! I just LOVE Brussels Sprouts Maria- great variation!! I am seriously obsessed with this recipe. I love B-sprouts but always make them the same way. I am going to make this for a pre-Thanksgiving party on Thursday – thanks! This is mouthwatering! I have been eating a lot of Brussels sprouts lately. I love the toppings you chose. I’m not waiting for Thanksgiving to make this! 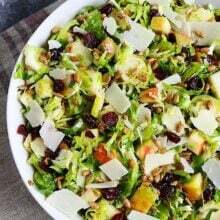 🙂 I tried a shredded brussels sprouts salad last year and loved it (I think it had a similar dressing but with walnuts and manchego), but had totally forgotten about it. Thanks for the reminder! Definitely making this soon! Love the blue cheese, pecans and cranberry combo! This salad looks divine and I love that you make it with chopped brussels! I’ve never tried brussels sprouts in a salad and I bet they’re wonderful! Great idea for a holiday side dish! I don’t think I’ve ever had raw brussels sprouts, I need to try that! This is one gorgeous dish! I love brussels sprouts! But I also haven’t tried them raw. Thanks for this new recipe! I love this idea, just amazing and yummy sounding. My hubby hates brussels but I am bound and determined to change his mind. The holidays are flying by so quickly, I already feel like I’ve missed everything! This salad looks great! I’m in love with this recipe already! We are BIG brussel sprout eaters and always have them on Thanksgiving… this is going on my menu for sure! This salad sounds like a dream!! Crunchy, salty, sweet and nutty! I just bought all the ingredients and will be making it this weekend, as a test run for Thanksgiving. I usually serve a nice green salad with all the other goodies, but unfortunately doesn’t get much action on THE day. However when you throw in some leftover turkey- it comes in handy in the next couple days as a lighter meal option. Wow, I need to celebrate another thanksgiving, this looks like fall in a delicious dish! I’ve never had raw brussels sprouts. Do they taste like cabbage? This salad looks fantastic and I love the idea of pairing them with cranberries. That looks heavenly! Bookmarking to make very soon. so this would be the way to get hubby to eat brussel sprouts? could one use candied pecans? if so would they still be able to be roasted? THANKS! You wouldn’t want to roast the pecans if they have already been candied. Last question.. it says serve immediately. Taking it to familes house, ok to make ahead or does it get too soggy. The BLUE CHEESE is not GLUTEN FREE !!! This year flew. The holidays are right around the corner and it is time to start thinking about all those great meals and desserts. The holidays are great for enjoying family, friends and yummy foods. I really try to make healthy low calorie meals and snacks that are also delicious. It can be done. This recipe is perfect. I will definitely put it on my list of dishes. I love this salad with spinach and I’ll have to try it with Brussels sprouts! Thank you for the recipe and the great images. made this today!! I found cranberry goat cheese crumbles and used that instead of blue cheese it was AWESOME!!! Do you slice the sprouts lengthwise or widthwise? Pingback: Healthy Thanksgiving Recipe Roundup! THANK YOU for this recipe. I made it yesterday and WOW – it was absolutely DELICIOUS!! I haven’t been able to stop telling people about it – have shared it with MANY friends and co-workers. Yummy!! Pingback: A Healthier Thanksgiving – Time to cook! Like so many of your recipes (and I’ve tried several! ), this sounds delicious. Thanks for sharing and happy new year. Pingback: 25 Side Dishes For Thanksgiving - A Worthey Read! Our granddaughter found this recipe a few weeks ago and has already made it several times…with rave reviews. I’m making it tonight for a side dish to my favorite garlic breaded chicken breasts. I’m also looking over your potato recipes for something to accompany this great Sunday night dinner. Thanks for your great recipes! Will be making your red pepper spaghetti squash tomorrow!! PS…Love Salt Lake City! !